Let's Talk "Of the Month"
Two awesome teams coming together to create an informative and exciting podcast series! First of all, if you haven't checked out Conscious Chatter or Good Support on their own- DO IT. Second, this is a perfect merging of worlds; Conscious Chatter is all about responsible consumerism and Good Support deals more with political and social justice issues. Together, it is magic! Host Lorraine Sanders talks "FEST", which is her acronym for "Fashion, Entrepreneurship, Sustainability, and Technology". Her podcast discusses all that and more with different inspiring female entrepreneurs! If Sam Sanders made a podcast where he just read his grocery list I would subscribe. In NPR's new pod Sam talks current events, political and otherwise, as well as conducts in depth interviews. Listen for a really good time! Sustainable Daisy is a blog created and run by Karen Housel whom I had the pleasure of meeting for the first time recently! Not only is she a super sweet person, her content is really fun and inviting. 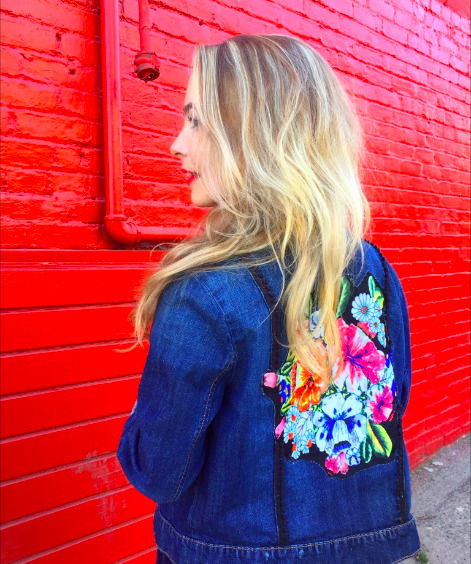 Check out her recent DIY adventure with the help of a Goodwill jean jacket, crafting supplies and a whole lotta love! I've referenced Study 34 a lot on this blog but only because Eleanor O'Neill's work continues to be so relevant! Two recent posts give brief, yet comprehensive, definitions of sustainable and ethical fashion respectively. Whether you're a newbie to this whole "conscious consumerism" thing or want to remind yourself why you got in the game- this post is for you. Paco de Leon is the founder of The Hell Yeah Group which aims to support and educate creatives on their finances. I've seen and heard Paco speak, subscribe to the company's newsletter, and have just purchased Paco's So You Wanna Start a Business manual. You could say I'm sort of a fan. In all seriousness, as someone who is gearing up to start her own business, this manual is a lifesaver. This company turns illegal guns and ammunition, provided by the police, into beautiful jewelry items. Incredible! The money you spend will help their business grow as well as "educate and protect an at-risk child from gun violence". Another jewelry company with a social mission; providing jobs to homeless men and women. Keys are repurposed into jewelry items that are made entirely in Downtown Los Angeles. Their commitment to employees' well being is pretty fantastic and their products are very well made. I recently met designer Shana Bea at the Melrose Trading Post and loved her use of color! She hand makes garments, body products, and handbags with a strong commitment to sustainability. Go see how ethics and aesthetics meet! What better way to celebrate Earth Day than to get your hands dirty? Check out TreePeople's calendar for tree care/planting events in Los Angeles this weekend. Don't live in LA? Find a local environmental organization to volunteer with or donate to! Kathryn lives in the Bay Area and attempts a zero waste lifestyle. She has been documenting her efforts for a few years and has some great tips on how to go about DIY cleaning, beauty, cooking and more! These new practices can take time to fully implement and each person's journey will look a little different. However, she has a great blog post to get you started. Kathryn is getting married next month and recently wrote about her efforts to have a zero waste wedding- check it out here. "Every year, nearly five billion plastic toothbrushes end up in our oceans and landfills." 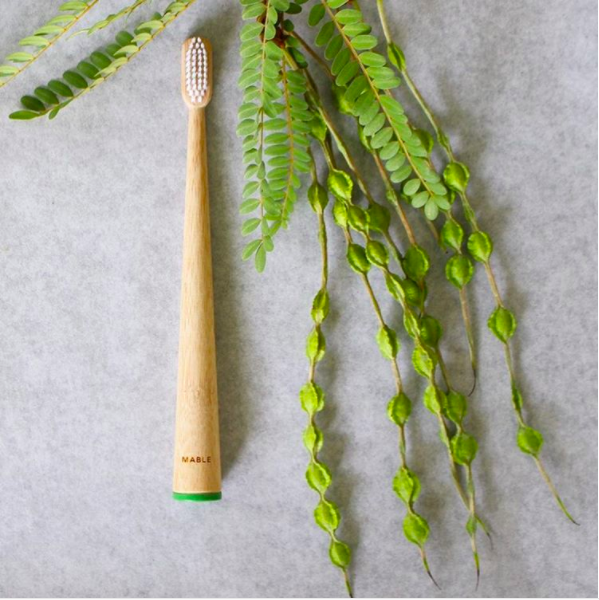 Mable toothbrushes are made of bamboo, BPA-free nylon bristles and non-toxic paint. The company even has a comprehensive video showing customers how to safely recycle their toothbrush after 3 or 4 months of use. Ditch the plastic and get yourself a Mable Brush! Another fun event happening in Los Angeles this weekend is Beyond the Label: Upcycling Lab at UCLA. The event is on Thursday, April 20th, from 10am-3pm and absolutely FREE. Go learn how to turn "trash" into treasure tomorrow!